FERC last week approved Tariff revisions that will allow CAISO’s Energy Imbalance Market to automatically recognize the capacity that participants outside of the ISO’s footprint use to maintain reliability in their own territories (ER15-861-006). In its filing proposing the change, CAISO told the commission that its software’s inability to recognize this “available balancing capacity” was creating false scarcity in the market, resulting in price spikes. The changes will ensure prices reflect the true nature of the deployed capacity, the ISO said. Under the revisions, each EIM participant will be required to identify the available balancing capacity of all its resources, even if it does not bid those resources into the market. “We agree that the available balancing capacity proposal will reduce the potential for imbalance energy price spikes by providing for greater visibility of the capacity each EIM entity has available to it to resolve power balance violations within its own [balancing area authority], even when that capacity is not being offered into the EIM,” FERC said. The changes also allow EIM participants flexibility to determine what capacity they should retain outside of the market to maintain reliability, the commission said. In a related order, FERC dismissed requests for rehearing of its approval of certain Tariff revisions by NV Energy to allow its participation in the EIM (ER15-1196-002). Powerex, a power marketer that operates in the western U.S. and Canada, and Truckee Donner Public Utility District, a municipal utility in California, objected to the commission’s approval of NV Energy’s use of CAISO’s LMPs to settle imbalances for transmission customers who opted out of the EIM. Powerex also asserted that NV Energy’s participation in the EIM would jeopardize resource adequacy in the Nevada utility’s balancing area. The companies based their complaints in part on price spikes and other problems in the market when PacifiCorp first joined. 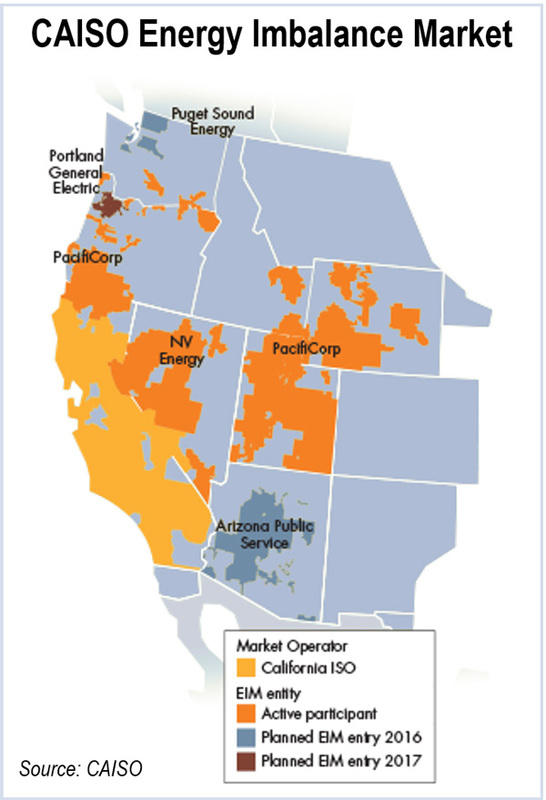 FERC said, however, that “CAISO has taken tangible steps to resolve the underlying problems that contributed to the price spikes” in PacifiCorp’s territory. The commission pointed to the steps the ISO has taken to resolve those problems — including the recognition of available balancing capacity. Increased transfer capacity is keeping a lid on congestion in the EIM and limiting participants’ ability to wield market power within their balancing authority areas, according to CAISO’s internal Market Monitor. FERC approved CAISO’s agreement for integrating Canadian power marketer Powerex into the EIM.